The Center for the Study of Law and Religion (CSLR) at Emory University has named Silas Allard, a distinguished alumnus of its joint degree program in law and religion, as Associate Director, to begin in August 2013. Allard is charged with leading CSLR, a world-renowned research center that has inspired a global expansion of law and religion studies during the past 30 years, into the next generation of scholarship. Among his primary roles will be to widen CSLR’s religious scope beyond the three Abrahamic religions to include Buddhism, Confucianism, Hinduism, Sikhism, Taoism, and Indigenous Religions. He also will help CSLR bridge its theoretical, historical, and comparative work into hands-on, practical, and community outreach work. Witte, a world-renowned scholar of legal history, and Frank S. Alexander, the nation’s leading authority on housing and homelessness, will continue to serve as CSLR co-directors. Witte is Jonas Robitscher Professor of Law and Alonzo L. McDonald Family Foundation Distinguished Professor. Alexander is Sam Nunn Professor of Law. With Allard’s appointment, they intend to begin building the next generation of leadership for CSLR. Among his duties will be a reorganization of CSLR’s structure and staffing, and the development of a journal, blog, and other new media in law and religion. “The Center always needs new ideas, new methods, new focus, new energy, new engagements to thrive, and we see Silas’ appointment as a critical first step in that effort of vital and perpetual reform,” said Witte. This “practical, lived engagement,” particularly surrounding human rights issues, has been an important part of Allard’s work and education. He came to Emory in 2007 with a background in comparative religious studies, including focused studies in Buddhism and Hinduism, and a strong record of grassroots organizing and community engagement. 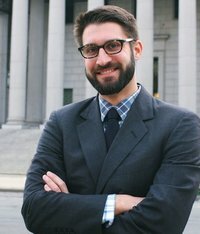 During his summer breaks from Emory, he worked for the National Security/Immigrants’ Rights Project of the American Civil Liberties Union of Georgia, and he interned at the United Nations High Commissioner for Refugees in Geneva. But it was under the guidance of Abdullahi Ahmed An-Na`im, Charles Howard Candler Professor of Law and a CSLR senior fellow, for whom he served as a research assistant, that Allard began to shape the vision of his future, one that included time in the field and then a return to the academy. Says An-Na`im about Allard’s appointment: “My father used to say that the only person one is happy to see excel more than he does is his own child. This is how I feel about Silas as my own intellectual, professional and ethical ‘child,’ though I can’t claim credit for his outstanding achievements. If whatever contribution I made to his excellence is all I did at Emory Law School, I will leave happy and content." Founded in 1982, CSLR has led the field of modern law and religion studies by administering nine major, multi-year research projects; hosting major international conferences; publishing more than 300 new books and two book series; and offering six degree programs and 40-cross-listed courses. Some 90 Emory faculty take part in the work of the Center, and it draws upon 1,600 scholars from around the world. Focused on the areas of marriage, family, and children; housing and homelessness; and religion, constitutionalism, and human rights, CSLR has approached these topics principally through the lenses of Jewish, Christian, and Islamic legal studies, and with an emphasis on law and religion themes in the Atlantic Continents. Alexander believes the time is right for Allard’s wider religious perspective and his social justice emphasis. “His youthful energy and enthusiasm, his understanding of Emory, his keen interest in human rights issues, and his compassion for those seeking justice will help us tackle some of the most pressing issues of the next generation,” Alexander said.